The house/table/furniture could get messy. Clothes will need to be changed, washed, or thrown out. It requires too much facilitation. I’ve seen shitmykidsruined.com, and there’s no way I’m allowing Sharpies in the house! I just don’t have the patience for it. Fair enough. Art projects are not for everyone, but after today’s convo I’m on a new mission to also share ideas that are easy on the parents’ will, time and emotions. In my own effort to tackle some of these issues, N’s little art table is always covered in plastic (our dining room table, pictured above, is an old high school table that came with expletives carved into its legs — so no worries there! ), we have aprons for painting and cooking, paints and markers are usually washable, and messy projects are often taken outside. A couple days ago we embarked on a little color-mixing activity that is SO surprisingly clean that my 2-year old asked, “Why is my hand not dirty? 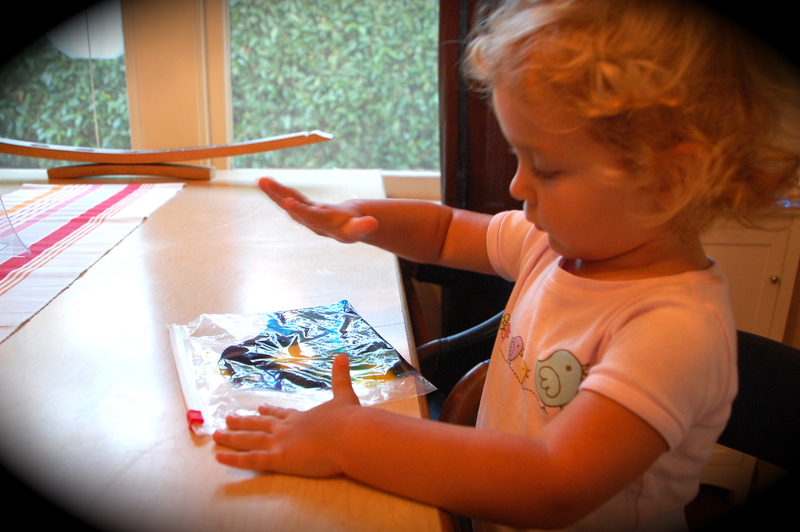 Is my hand dirty?” All you need are some squeezable paints (tempera or acrylic — makes no difference) and a zip-lock bag with a good seal. This last part is critical! Open the bag or have your child open the bag. My daughter wanted to hold the bag open. Hand it to your child to experiment with, mush around, squeeze, etc. 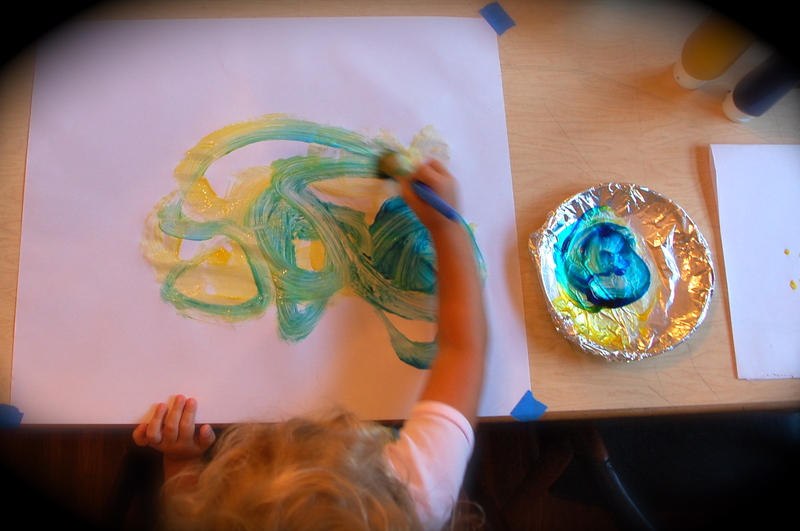 Young children will be interested in the sensation of smooshing and mixing, and older children may be interested in “drawing” into the paint by pushing down on it against a hard surface like a table. We tried this, but it was a solitary sport for mom. After playing with “clean” paint for a few minutes, N was jonesing to actually paint, so I carried the “one color at a time” idea over from the first project into what you see in the photo above. She picked the color she wanted to begin with (yellow), and then chose colors to add, one at a time.” The first painting was yellow/blue, and the second was yellow/blue/red. After that, she was done. thanks for this post Rachelle, I must admit that apartment living with wall to wall carpeting has held me back in terms of which art projects Jonas and I do…but this is a great activity and I plan on trying this out! I’m so glad to hear this speaks to you. Carpeting is tough, and And you’re giving me more encouragement to share easy and clean art activities. Off the top of my head, some great materials for you to consider are stickers, glue (gluing pasta, beans, pom-poms, etc. ), crayons/markers/pencils, glitter sticks (paint + glue…all tidy in one little squeezable container), and stamps. You could also pick up some inexpensive interlocking kids foam floor tiles (like these: https://www.amazon.com/Uppercase-We-Sell-Mats-Puzzle-Each/dp/B0012YMWO0/ref=sr_1_1?ie=UTF8&s=baby-products&qid=1281736749&sr=1-1 ) or even a professional painter’s drop cloth that easily folds away when not in use. I wanted to share with you my fingerpainting photos. I was inspired to go ahead and get the paints out thanks to this entry, so thought you should see them! Andi and Hannah joined us today painting, but unfortunately, I didn’t get a picture of that. Thanks for continuing to inspire me! Hiya very nice blog!! Man .. Excellent .. Wonderful ..